There are numerous types of Specialty Storage Racking to fit certain products and applications. The following are types of Specialty Storage Racking we can provide. Tire racks safely store and display automobile, truck and other vehicle tires. 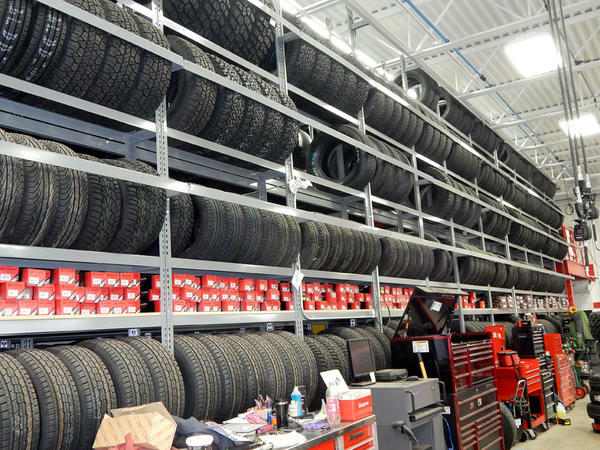 Tire rack systems are assembled into tiers to accommodate large quantities of tires. Tire Racks are built for easy tire removal and storage. We offer numerous types of tire racks depending on your needs and requirements. Record storage racks are high-capacity steel racks designed for storing all record and document storage containers, no matter the size or weight. These storage racks can be customized in multiple sizes and variable heights to accommodate your record storage needs and make the most of your warehouse space. From medical files to architectural documents, whether you archive your records in cardboard file boxes or plastic bins, open-file containers or in bulk, our record storage racks can hold large capacities on each level and keep records organized, accessible, and safe. Record storage racks can be used with wire decking or particleboard shelves, depending on your business needs. Stack racks are a cost-effective, compact, and portable solution for items that are of various shapes and sizes. They are ideal for storing items vertically in order to save space. Stack rack systems are easy to assemble and dissemble and can be stored compactly when not in use. Additionally, portable stack racks allow you to easily adjust their warehouse floor plans as needed, offering maximum flexibility. Mobile aisle racking provides maximum density and space utilization. Using any type of standard racking, mobile aisle solutions utilize a wheel and rail system to allow the rows to traverse back and forth to create access aisles. When access is not required, rows of racking are stacked closely next to each other, with maximized storage/space utilization. When racks need to be accessed, you manually or automatically move the rows of rack to create an aisle. The movement is easy, and relatively quick. Mobile aisle racking is an excellent method for high density storage for slow-to-medium moving items. Empty Pallet Storage Racking is designed to store empty pallets in under-utilized parts of a warehouse facility, above dock doors for example. These racks provide excellent space utilization benefits as they are designed to attach to walls without the need for standard upright frames and therefore don’t present obstructions at the floor level. Call us at (866) 266-2244 and one of our racking specialists will come out and survey your applications today to help you find the right Specialty Storage Racking solution for you.